As a beloved teacher at Norland High School in Florida, Symonette has been able to touch the lives of many inner-city students through her passion for writing. Like the Freedom Writers, many of Symonette’s students are disadvantaged, but far from unteachable. She has been able to mold these young minds into strong, educated powerhouses that are transforming their lives through writing. Symonette’s classroom has become a close-knit community where each student supports each other and pushes one another to become a better writer. As a result, many of her students have improved academically and have been able to get on track to graduation. Like Erin Gruwell, Symonette has been able to teach some of her students for their entire high school career, and her senior Freedom Writers will be able to attend college. Symonette has always been a winner. With an impressive resume and extensive classroom experience, it is no wonder she has been teacher of the year at Norland High School twice before. But now she’s creating buzz on a larger scale by winning her county’s biggest honor, the Francisco R. Walker Teacher of the Year. Symonette has taught Freedom Writers ideals since 2010 when she learned one of her students was cutting themselves. 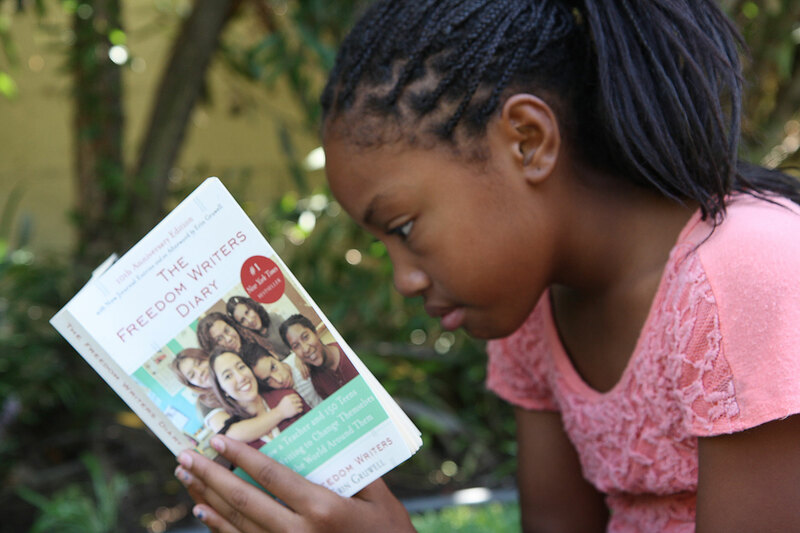 In an effort to find ways to support her students more, she found “The Freedom Writers Diary.” The Freedom Writers Teacher Institute was clearly the next step. With her school unable to provide the funds, she went out and raised money on her own through speaking engagements with three different organizations. “One of the many things that I value the most about the Freedom Writers Foundation is having the opportunity to collaborate with fellow educators around the world and having the opportunity of learning from master teachers, like Erin,” said Symonette. Everyone at the Freedom Writers Foundation is proud to have amazing Freedom Writer Teachers, like Precious Symonette, showing the world that every student can learn and become passionate about their education despite the many obstacles students may face. It’s always humbling to know even a seasoned teacher like Symonette found the Freedom Writers Teacher Institute to be of great value.